The Geological Society of London has designated 2019 as the “Year of Carbon.” Throughout the year, the Society will explore the geoscience of carbon through research conferences, public lectures, educational programs, and other activities. The Geological Society of London (GSL) has designated 2019 as the “Year of Carbon.” Throughout the year, the Society will explore the geoscience of carbon through research conferences, public lectures, educational programs, and other activities. A number of planned activities focus on deep carbon. Highlights are listed below with a complete list available here. The Volcanic and Magmatic Studies Group (VMSG) is a joint special interest group of the Mineralogical Society of Great Britain and Ireland and the Geological Society of London. VMSG is the main hub for the UK community of igneous, volcanic and magmatic scientists. Decarbonisation is central to Government and international policy and this three day conference will host national experts from industry, academia, and government to look at the geological and reservoir engineering aspects of the problem. The main objective will be to identify the high level barriers to progress and the main science questions — and begin a roadmap to solve the problems. This three-day meeting will bring together early career geoscientists and senior members of the Deep Carbon research community. Presentations and discussions will encompass the latest advances in our understanding of the behavior of carbon at the extreme pressures and temperatures of the Earth’s deep interior, the exchange of carbon between the near-surface and deep reservoirs, the abiotic development of organic compounds through deep time, and the extreme limits of life on Earth. Mentoring activities will take place throughout the meeting, where senior scientists will lead small group discussions about their research careers and experiences in academia. The 2019 Lyell Meeting will bring together a broad spectrum of scientists to address the big picture of carbon in Earth’s system, drawing on expertise in palaeontology, geochemistry, palaeobotany, atmospheric processes, deep-Earth processes, and anthropogenic impacts. This meeting seeks to foster conversation between these disparate communities to facilitate a more holistic approach to considering carbon, and how it cycles between Earth’s organic and inorganic reservoirs. The story of Earth is a 4.5-billion-year saga of dramatic transformations, driven by physical, chemical, and—based on a fascinating growing body of evidence—biological processes. The co-evolution of life and rocks, the emerging paradigm that frames this lecture, unfolds in an irreversible sequence of evolutionary stages. Each stage re-sculpted our planet’s surface, while introducing new planetary processes and phenomena. The cycling of carbon played central roles as each stage inexorably paved the way for the next. This grand and intertwined tale of Earth’s living and non-living spheres is only now coming into focus. Diamonds, thought to form in the upper mantle and the mantle transition zone (410–660 km) often incorporate small pieces of surrounding material when they form. These inclusions provide a unique window into the deep mantle, giving researchers much-needed information about the composition of our planet as well as processes which took places millions and billions of years ago. Dr. Kiseeva will give an overview of deep diamonds and their inclusions: how these diamonds form, what minerals they bring, what they tell us about the composition of the deep mantle, and how they relate to the deep carbon cycle. In this talk, volcanologist Professor Tamsin Mather will explore some of the different types of volcanic activity that we see on Earth today and have seen over its geological history. She will reveal how studying volcanic gases and rocks today can give us fundamental insights on some of the drivers of long-term global climate evolution and some of the most profound environmental changes in geological history including mass extinction events. A closeup of the crystals in the carbon-bearing mineral rutherfordine. 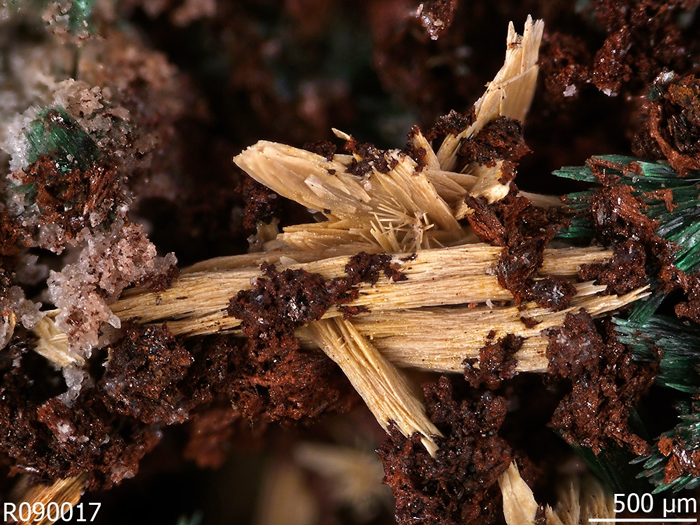 View a gallery of carbon-bearing minerals here. Image courtesy Rruff Database.